The first accurate western European maps of the Caucuses. Carte des Pays Voisins de la Mer Caspiene, dressee pour l'usage du Roy. Sur la carte de cete Mer, faite par l'ordre du Czar, sur les Memoires manuscrits de Soskam-Sabbas, Prince de Georgie, sur ceux de Mrs. Crusius, Zurabek, et Fabritius Ambassadeurs a la Cour de Perse, et sur les eclaircissemens tirez d'un grand nombre de persones intelligentes du pais. Assujetie aux observations astronomiques. Par Guillaume Delisle, Premier Geographe du Roy, de l'Academie Royale des Sciences. 15 Aout 1723. An example of Guillaume de L'Isle's 1723 map of the Caucuses. Covering from the Black Sea to Independent Tartary and from Russia to Persia, inclusive of the entire Caspian Sea, and the modern day nations of Georgia, Armenia, Azerbaijan, Kazakhstan, Turkmenistan, Iran, and Turkey. This is one of De L'Isle's most important and misunderstood maps. 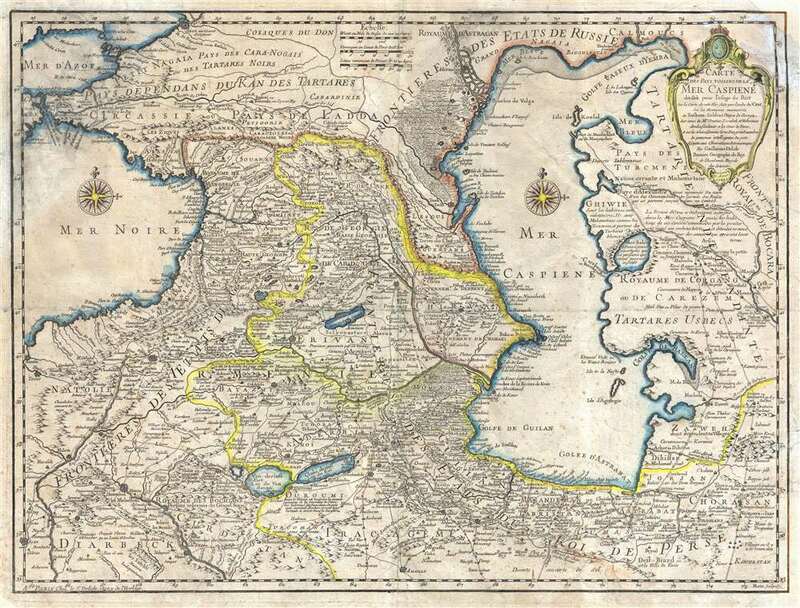 Knowledge of the Caucuses and Caspian Sea region was extremely limited in Western europe and so De L'Isles composed this map from assortment of sources, many of whom he lists in the title cartouche, including the Caspian Sea surveyor Vanverden, Persian diplomats, Georgian aristocratic and religious figures, and various Russian surveys. The result is this remarkably accurate map, a major step forward in the cartographic perspective of the region, and one of the finest maps De L'Isle ever produced. engraved by Marin for the 1731 issue of De L'Isle's seminal Atlas de Geographie. De L'Isle, G., Atlas de Geographie, 1731. Average. This map exhibits a number of issues including numerous verso repairs and reinforcement, light foxing, and overall age toning. The upper and lower right corners have been replaced in manuscript. Priced accordingly. Rumsey 4764.080. Allen, W. E. D., 'The Sources fo G. Delisle's 'Carte des Pays Voisins de la Mer Caspiene' of 1723,' Imago Mundi, vol 13 (1956), pp. 137-150.